My children’s birthdays are only two days apart, so we have only one party. That party is rapidly approaching, and though I ask guests to not feel compelled to give gifts and to consider the planet when doing so, my children like to give out party favors to their friends. There is nothing I hate more than coming home from a birthday party with a bunch of dollar store junk we have to get rid of immediately. Now, GreenPartyGoods offers solutions for eco-friendly birthday parties. While walking my dog through our local park and watching families disassemble their parties, I was horrified at all the waste that ended up in the garbage cans. Bags of plastic utensils, plastic table cloths, crepe paper and cheap goodies bags filled with dollar toys headed for land fill. This is what motivated me to create GreenPartyGoods. Toy Wooden Racing Boat: These hand-crafted, hand-painted wooden racing boats are my favorite party favor and the ones we will be giving to our party guests. Since we hold our party at the river, the boats will be perfect for added water frolicking fun. The boats are made by award-winning Anatex. The wood comes from Germany, paint from Russia, and assembled in China. They are tested lead free by a third party and cost $2.50 a piece. Wooden Baseball Sports Collapser: This is the classic toy where you push the button and the figure moves around. They are four inches tall and made by Anatex from German wood, Russian paint, and assembled in China. These toys cost $3.00 a piece, and I have a feeling the novelty would wear off rather quickly with them. 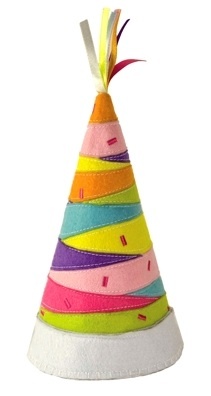 Felt Party Hats: Available in a variety of themes, from pirates to princesses, these hats are so adorable! Theses hats won’t just be tossed away at the end of the party, because the felt construction makes them durable ensuring they will enter into your child’s dramatic play long after the party is over. These party hats cost $5.95 a piece. Toy Horse Finger Puppets: These puppets are really cute and made by Schylling, a usually dependable toy company, although they have been involved in some of the recent recalls. These puppets are soft plush, which I assume is polyester, and are made in China, so they are probably the least eco-friendly option available from GreenPartyGoods. They are perfect for a horse themed birthday party though. The puppets cost $2.50 a piece. GreenPartyGoods has an extensive selection of eco-friendly party supplies beyond party favors. From corn plates to bamboo plates, this site does offer one stop shopping for your green birthday party. I am so happy to have found it! Thanks for the wonderful suggestions for eco-friendly kid’s birthday parties. I’ve often felt so guilty tossing 40 or more dirty paper plates and cups into the trash for my twins birthday party. I’ll go to GreenPartyGood first next time! I have created a Green Birthday Party Planner for those interested. The link in my last comment does not seem to be working. My planner can be found at hoisingtonbooks.com under Articles. Just read your article and found it so inspiring! One toy we’ve forgotten (but played with long ago) are bean bags. My company makes them, with different fabrics based on gender, filled with organic peas. You could set up some buckets and have kids of all ages do a bean bag toss game. Give out organic lollipops as a treat for ‘scoring’ in the bucket. Even a 1 year old would look cute trying this. We also carry biodegradable tableware, cloth decorations, and many sustainable goodie bag options. Give out organic lollipops as a treat for ‘scoring’ in the bucket. Even a 1 year old would look cute trying this. We also carry biodegradable tableware, cloth decorations, and many sustainable goodie bag options.